Mud Bath at the Big House, Duo Cleans House with UTV and Pro-4 Sweeps. 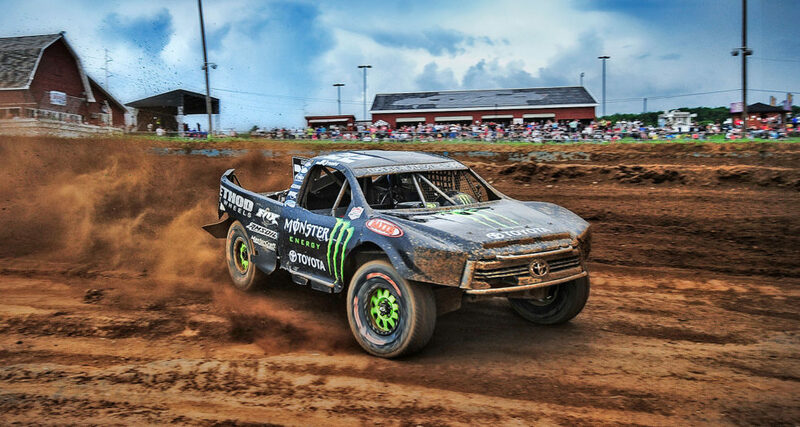 The 2018 racing season started with a lot of uncertainty about the TORC series so Crandon and other Midwest tracks partnered with Lucas Oil to form the Lucas Oil Midwest Short Course League to conduct the 25th annual Potawatomi Brush Run at Crandon International Raceway. The Greaves Duo of Johnny and CJ along with Rodney Van Eperen and new team member, Adam Reek, were ready to get the season started. Like last year, the “Big House” became a muddy house as rain once again plagued the Saturday races. The famous Crandon track crews worked feverishly to get a decent racing surface. Also, the track was shortened for the first time and gave a short course feel to a normally long and gnarly track. The Pro-4’s were bumped to Sunday morning. When the mud settled, CJ took both Pro Stock UTV races and the Pro-4 race, just ahead of Johnny who came in 2nd. Johnny prevailed to take his 6th FC Potawatomi Community Cup in the Pro-4 vs. Pro-2 race. CJ came in a close second for another father-son sweep. Rodney came in 2nd on Saturday and took the win on Sunday in the Pro Mod UTV class. Adam also ran strong but experience mechanical problems that sidelined him in both races. SUNDAY: The Pro-4 races were pushed to Sunday. The weather was great and the track was in near perfect condition with the exception of some mud on the sidelines, which presented a problem if a racer got off the track. Johnny Greaves took the turn-one holeshot in the Pro-4 race on Sunday with CJ trailing in 3rd behind Ross Hoek. CJ went for the pass in the gravel pit, but Hoek made a block that sent CJ off the track and into the mud. However, CJ was able to complete the pass on the next lap putting the two Greaves nose to tail to battle for the rest of the race. Just ahead of the competition caution, Johnny caught a rut and over rotated sending him off the track momentarily and to the back of the pack. This handed the lead to the younger Greaves. On the restart, Hoek and Carlson were battling and went wide in the gravel pit turn. Johnny ducked his familiar #22 Monster Energy/ Maxxis Tire/ Toyota to the inside and passed both setting up yet another Greaves Duo showdown. Johnny and CJ went nose-to-tail the rest of the race with CJ’s Monster Energy/Mutant Soda Toyota coming out on top and Johnny taking a close second. SATURDAY: Saturday, thirty-three Pro Stock UTV’s took to the green flag in the pouring rain for a 12-lap race on the shortened track. The holeshot vehicles made it through the landrush start but several were not so lucky. A crash in FC Potawatomi turn one brought out the red flag that stopped the race on lap 1. After starting 22nd, CJ quickly made his way all the way to 2nd and the top 2 UTV’s checked out to a 20 second lead on the rest of the field. CJ made the pass on lap 8 as a full course caution flag flew which moved him back behind the race leader Jesse Krause. CJ got a run on the leader heading into the preferred passing lane in the gravel pit turn and made the pass for the lead with only 2 turns to go on the last lap. CJ and Klaus finished the race a good 30 seconds ahead of the 3rd place vehicle. Adam Reek started 2nd and was running strong in his Yamalube/Maxxis Tire Pro Stock UTV but his front wheels made contact with another racer, which caused the steering to lock up. He had to pull out of the race. SUNDAY: On Sunday, CJ lined up in the pole position for the Pro Stock UTV race. He lead the 27 vehicle field to turn one and checked out all the way to the mid-race competition caution on lap 7. CJ jumped his Monster Energy Yamaha Racing/Maxxis Tire/Yamalube YXZ 1000R to a quick lead and was looking like he would cruse to the win when a flat right front tire made for a nail biter in the final laps. Fellow Yamaha racer, Jake Lunderby, gave CJ a run for his money but Greaves was able to hold him off and take the win. Adam was again looking strong in his Pro Stock race, coming from the back and passing Lunderby. The two Yamaha’s continued a good battle for a couple laps in 5th and 6th but Saturday’s mud race gave an unforeseen engine problem causing Adam to run at a slow pace. SATURDAY: Rodney Van Eperen started 17th in the Pro Mod UTV class on Saturday’s rain soaked track. When the leader spun-out, Rodney took the lead on lap 1 making the dramatic run from 17th to 1st in the early running of a race that was loaded with cautions due to the slippery track and UTV’s getting stuck in the mud. Midway through the race, Rodney’s machine stalled in the turn just before the start/finish line. By the time he re-fired his machine, he had dropped to 6th place. With just a few laps to go, he had made his way back to the front, just behind the race leader, Elliot Burns. He ran out of time in his charge to the front and had to settle for the runner-up spot on the podium. SUNDAY: In Sunday’s Pro Mod UTV action, Rodney Van Eperen landed in 2nd behind Elliot Burns after a caution slowed the 20-car field. On the restart, Rodney patiently looked for the opportunity to make the pass for the lead. Burns ended up breaking something in the front-end of his machine, which allowed Rodney to take a commanding lead and the victory. SUNDAY: The final race of the weekend was the much-anticipated FC Potawatomi Community Cup race that puts the Pro-2’s and Pro-4’s on the track at the same time. With a 45 second head start; the Pro-2’s the hit the landrush start in an effort to put as much distance between them and the Pro-4’s. The track was extended to full length for the 8-lap race with no competition caution. Carlson and Kincaid were the top 2 running Pro-2’s as Johnny grabbed the holeshot for the Pro-4’s with CJ in tow. By lap 5, Johnny and CJ were working their way through the Pro-2’s but a full course caution bunched the field up. Following the restart, Johnny powered through the field and checked out. CJ on the other hand got tangled up with Vanden Heuvel and went off the track. He was able to get right back into the hunt and passed the remaining competitors. He began to track down the elder Greaves who already had a more than 5 second lead. Johnny grabbed the win—his 6th FCP Community Cup win! CJ came in second to complete the father/son sweep. Next up for Greaves Motorsports will be ERX Motor Park, Elk River, Michigan on July 13-14th.